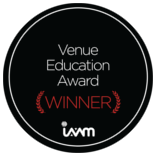 (Tulsa, Okla.) August 6, 2015 – SMG Tulsa was awarded the 2015 International Association of Venue Managers (IAVM) Venue Education Award on Monday, August 3 at VenueConnect, IAVM’s 90th Annual Conference & Trade Show in Baltimore, MD. This prestigious award acknowledges allied organizations, venues and academic institutions that demonstrate active student involvement, excel in available educational opportunities as well as demonstrate leadership in education. The Award also honors individuals who are actively involved in the education and continuous development of the venue management industry. The criteria used to evaluate the venues are key components to the success and vitality of the venue industry. A committee of industry leaders chose the finalists and winners were approved by the IAVM Board of Directors. SMG Tulsa also believes in the importance of developing the next generation of industry professionals. The company has helped dozens of college students gain real world venue management experience while enabling them to earn credit towards their degree. Students who entered the internship program worked on all levels from marketing to guest services to special events and operations gaining practical, front line experience with patrons, artists, and vendors. The students had a combined total of over 2,400 hours in learning experience during their internships. Continuing education and training for employees is something that SMG Tulsa prides itself on and this past year numerous employees attended conferences and training courses including: Venue Safety/Security courses, industry conferences such as Venue Management School, Event and Arena Marketing Conference, IAVM VenueConnect, Association of Luxury Suite Directors Conference and the International Entertainment Buyers Association Conference. Employees also attend various seminars annually to enrich their ability to provide great services to our customers and also to better lead and manage the staff of SMG Tulsa.